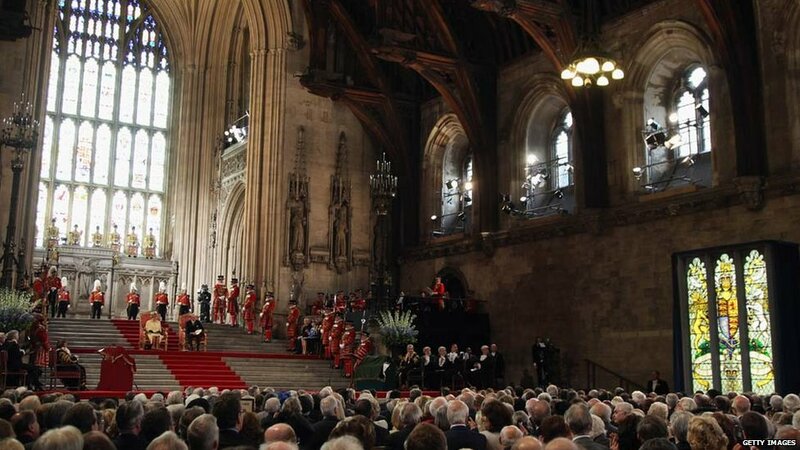 Party leaders, MPs, peers and dignitaries gathered in Westminster Hall to hear the Queen make her Diamond Jubilee address. 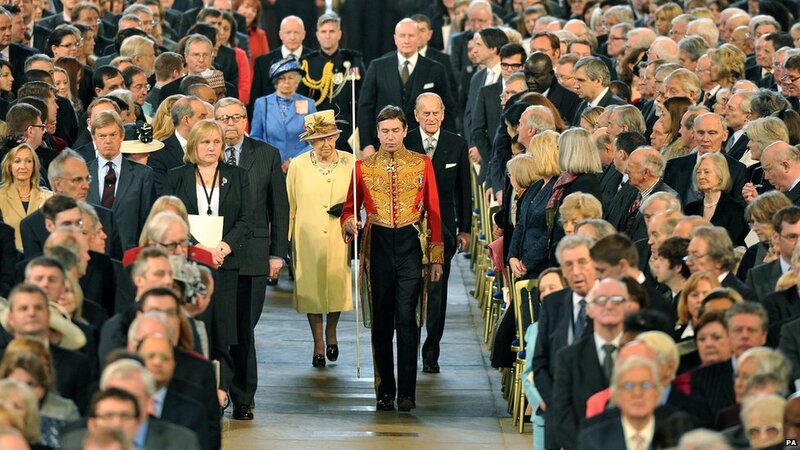 Such events have been staged in the hall since George V's Silver Jubilee in 1935. 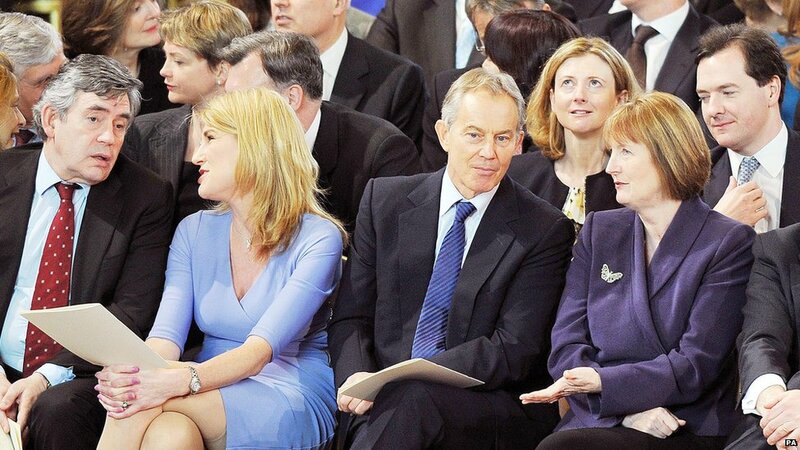 Among those gathered to hear the speech were former Prime Ministers Gordon Brown and Tony Blair. Between them sat Sally Bercow, wife of the Commons Speaker, and behind them Chancellor George Osborne and his opposite number Ed Balls also spent time chatting animatedly - perhaps about Wednesday's Budget. 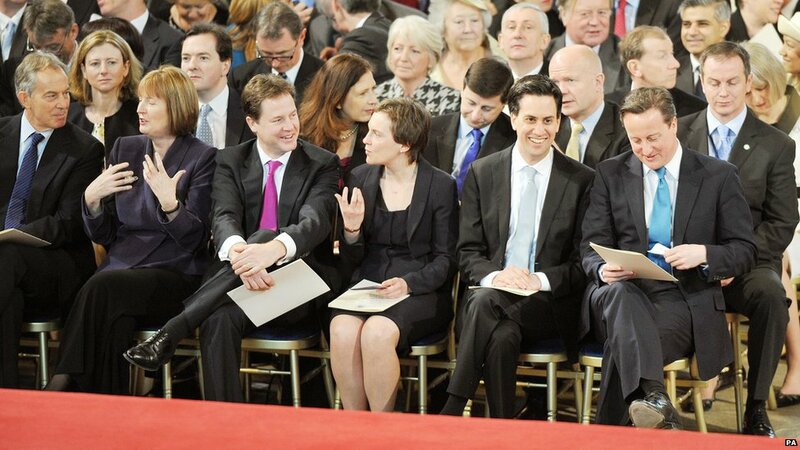 Prime Minister David Cameron spoke with Ed Miliband ahead of the speech, while Deputy PM Nick Clegg chatted to the Labour leader's wife Justine. Politicians are used to hearing the Queen speak once a year when she opens Parliament and outlines the government's legislative agenda. 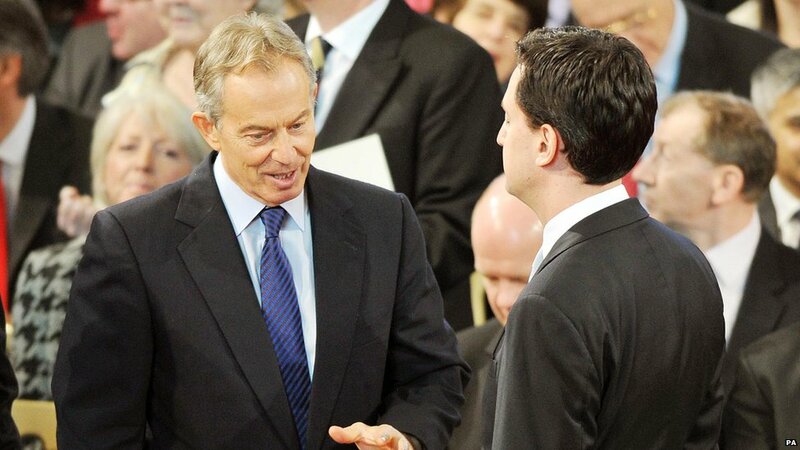 Mr Blair and Mr Miliband also found time to catch up before the Queen arrived. 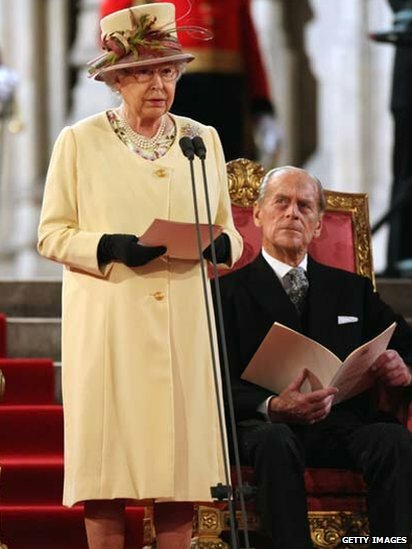 The Queen - wearing a butter yellow dress coat and hat - was accompanied by Prince Philip She addressed Parliament in 1977 and 2002 to mark her Silver and Golden Jubilees respectively. 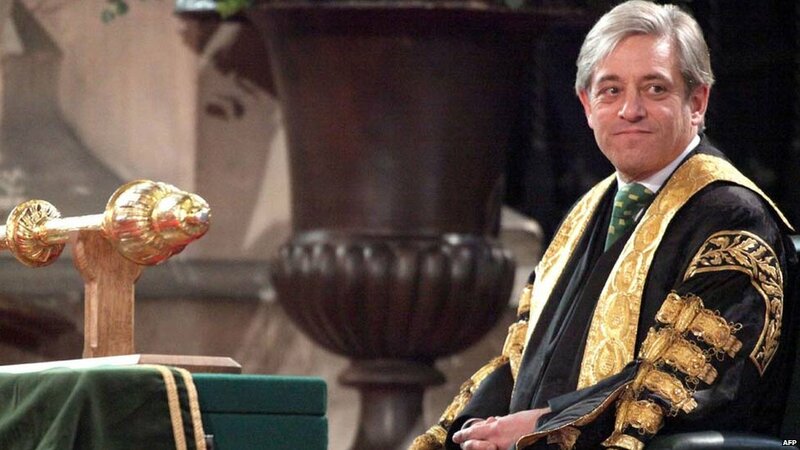 Commons Speaker John Bercow gave an address before Her Majesty. He said she had become "a kaleidoscope Queen of a kaleidoscope country" - referring to the UK's diversity. 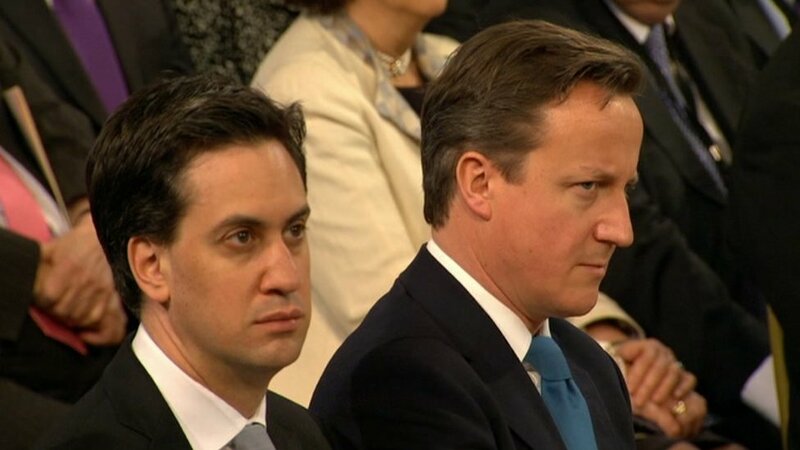 Mr Miliband and Mr Cameron listened as Mr Bercow praised the Queen's "unique capacity to hold together" the nation through times of great change. 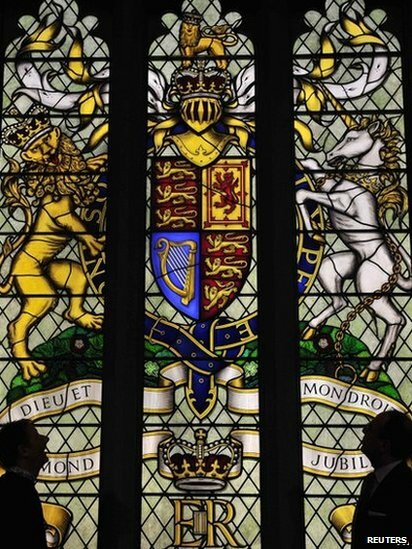 The Queen said she was "very touched" by the new stained-glass window created for Westminster Hall to mark her 60 years on the throne. It is a gift from both Houses of Parliament. The window, designed by British artist John Reyntiens, will go on permanent display above the North Door of Westminster Hall later this year. It features the Queen's Royal Arms. The Queen described Prince Philip as "a constant strength and guide" during her time on the throne - although she said he was "well-known for declining compliments of any kind". 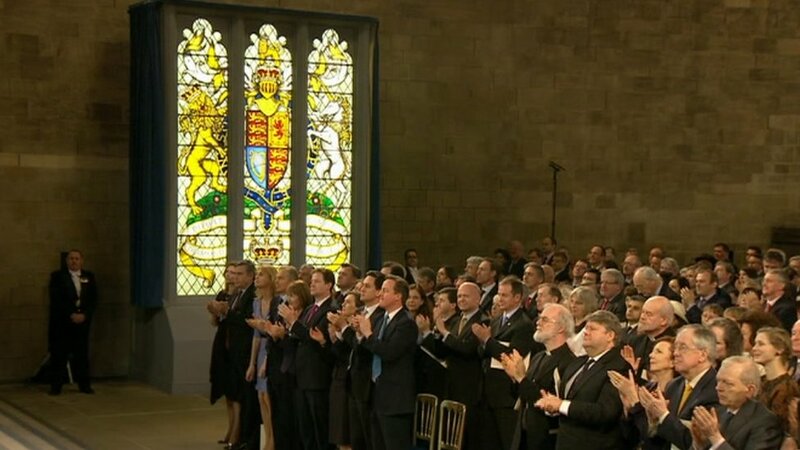 The Queen received a standing ovation at the end of her address. 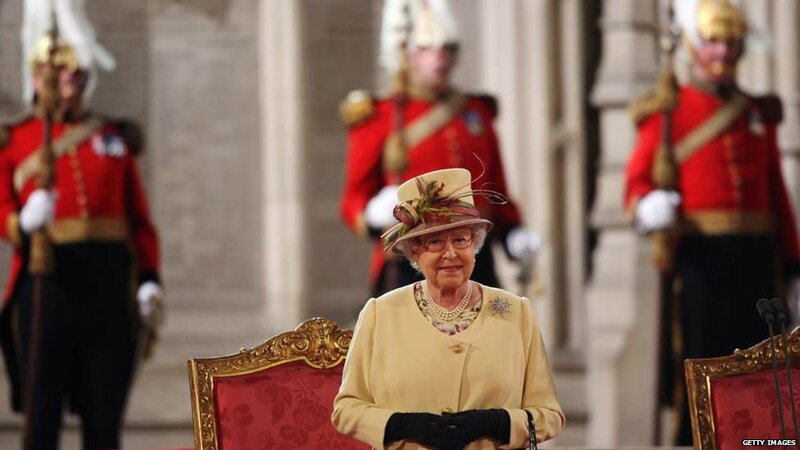 Archbishop of Canterbury Rowan Williams - who announced last week that he was stepping down from office - attended the event and spoke to the Queen at a reception afterwards.